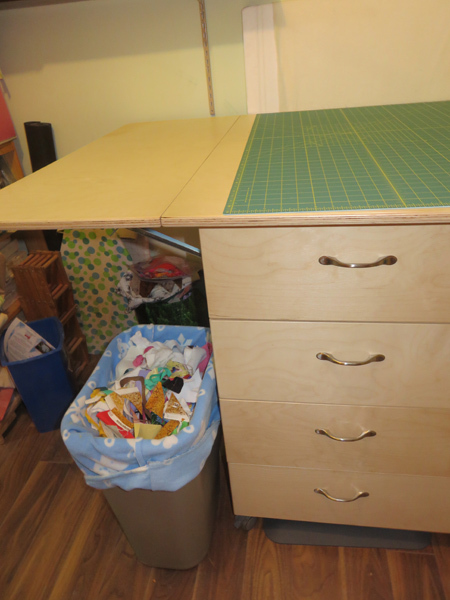 As any crafter knows, every project helps you add to your stash of scraps. When I am quilting, I will keep pretty small scraps because you can make use of some pretty tiny bits on art quilts. 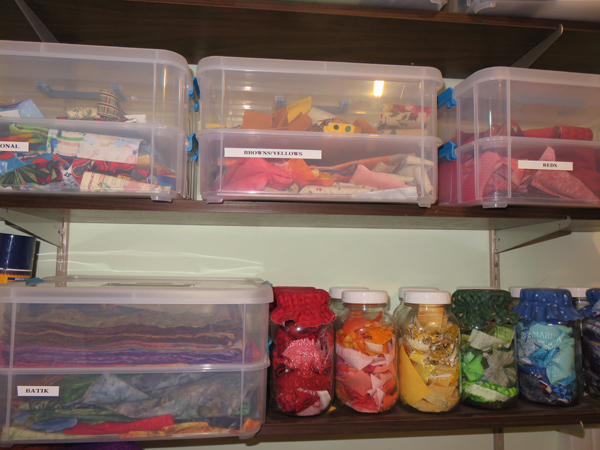 I have them on shelves sorted by colours with strips and larger pieces in bins and smaller pieces in mason jars. That way, I can see the colour – and it is so attractive it can be part of the décor too thus serving an added function. In case you are curious, some of the jars have colour-matched lids because those were left over from covers I made for preserves I was giving as gifts — I haven’t yet gone so far as to make covers just for jars on my shelves but really should do that. But, to get back to my point, there are some scraps that are too small to save. Like when I am taking apart ties like in my recent blog post on Memory Quilts. Also, there are practice pieces, especially small quilt sandwiches for practising Free Motion or trying new decorative stitches. I had been piling those up until I saw a great idea somewhere to collect those for a pet bed. I think that I first saw it with Jenny Doan at the Missouri Star Quilt Company. She is such fun. Here is that resource – there are plenty more available on the topic. As it happens, I need to make some replacement cat beds so I have been collecting scraps in a pillow form next to my cutting table. It took awhile to get enough scraps but finally got around to finishing and it is cute. This picture doesn’t do it justice — doesn’t even look that full. The best part is I know everything in there is washable and it will be easy to fluff up and reshape. Hopefully, the cats will like it. I will have to get back to you on that and try to get a picture of one of them on it. In the meantime, please leave comments with other pet-related scrap projects. Previous PostMemory QuiltsNext PostWhat inspires you to create?